Bruce Adam Hazenstab, 64 of New Brighton passed away on Thursday January 24, 2019 in Beaver Valley Nursing and Rehab. He was born in Rochester on May 26, 1954 the son of the late Adam and Marguerite (Peggy) Hazenstab. He was a graduate of Freedom High School in 1972. Bruce also attended the Adult Co-op Program at Penn State Beaver for Hospitality Food Prep. He worked for Armco Steel Co in Ambridge for 15 years until its closing. Jackson’s Gulf Service Station and Jackson’s Auto Parts in New Brighton. He was a member of the Beaver Valley Yacht Club where he enjoyed his passion of spending time boating and hanging out with friends on the Beaver and Ohio Rivers. He was a lifetime member of St. Felix Roman Catholic Parish. In addition to his parents, he was preceded in death by his brother Robert Hazenstab. He is survived by his “Big Sis” Donna Lack & Chuck Hatt, Freedom; 4 nieces: Jennifer (Shawn McCartney) Lack; Kelly (Josh) Schaller, Stacy (Jayon) Blagg; and Shari Haugh; 4 great nieces and nephews: Jaden, Gretchen, Jacob, and Jaxen; and special friends: Pete Bills and Michael Bartoles . A memorial mass will be conducted on Saturday February 2, 2019 at 10am in St. Felix Roman Catholic Parish, Freedom. Private interment will be in Calvary Cemetery, Freedom. 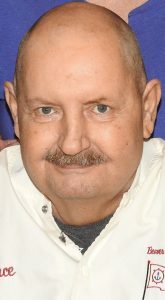 The entire staff of Beaver Valley Nursing and Rehab, Grane Hospice, Trinity Family Practice, Heritage Valley – Beaver Campus Critical Care and Cardiopulmonary Floors, and the many agencies that enabled Bruce to live well and long.